The overview effect: Can space tourism save planet Earth? When the Intergovernmental Panel on Climate Change (IPCC) recently reported scientists are 95% certain that humans are the “dominant cause” of global warming since the 1950s, it should have gone some way towards convincing the skeptics that action is needed to curb the damage we’ve done to this fair planet of ours. As expected, however, the naysayers, doubters and general rabble-rousers puckered up and continued the charade. Yes, it seems no matter what evidence is available, the inconvenient truth is just way too inconvenient. Too many people have too much at stake to seriously look at switching to a greener, renewable form of energy. Without delving into all the evidence again here, there is one gargantuan fact that seems to elude the detractors: all that lovely oil and gas is finite. Yes, the arctic ice receding which could open up more territories to speculative drilling which could mean a shitload more oil and gas, but all it will ultimately do is buy us more time. So what will it take to convince the world – the decision-makers, opinion-formers and everyone in between – that it’s time to look at the bigger picture? We can’t just yank the ladder up and say “screw you” to future generations. We can’t just cross our fingers and latch on to that 5% doubt that still lingers among climate scientists. The time to act is now. But as has already been shown, science, facts, likelihood, probability – whatever – isn’t sufficient to swing the pendulum far enough back in the favor of taking swift action on renewable energy. What’s needed is a massive cognitive shift, and this could come via a rather unlikely route. 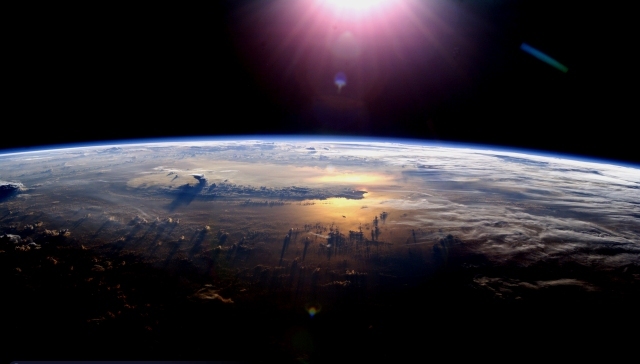 Have you ever heard of the overview effect? In a nutshell, it’s a sensation experience by astronauts who venture into space and look back at Earth. Imagine it for a second. Looking down on our beautiful blue planet, no noise, no visible pollution or wars, no real reason to harbor any feeling other than one of love, respect and humility. But in that moment of clarity, you do remember the myriad of warring ants and money-hungry miscreants strewn across the globe, and realize that nothing really matters beyond that of planet Earth. No planet? No people. End of. It’s this sort of epiphany we need to get the powers-that-be to experience. Their minds must be blown before the planet’s chances of survival are blown. And this is hopefully where space tourism can help. 2014 should herald the first commercial trips to space, courtesy of Virgin Galactic. But it won’t be cheap. Each trip will cost north of $200,000 which obviously means only the rich will be able to afford such a folly at first. But rich people are typically those with influence too – corporate bosses, celebrities and politicians. If we get enough influential people stumping up the cash to travel into space, it may just lead to enough epiphanies to get serious conversations going down on Earth about the action needed to kickstart something revolutionary for the human race. Real change. Yes, it may be clutching at straws somewhat. And yes, it’s probably very fanciful thinking. But as things stand, there doesn’t seem to be any significant, tangible actions designed to safeguard Earth for the next hundred or even thousand years. Meanwhile, check out this awesome documentary on the overview effect, where astronauts describe the sensation of looking back down on their home planet.